How does Calgonate® Gel help reduce HF burns? Who should stock Calgonate® Gel? Do I need a prescription to purchase Calgonate® products? What should I do if HF comes into contact with my body? Should I use Calgonate® Gel if HF comes in contact with my eyes? Is Calgonate® Gel FDA approved? 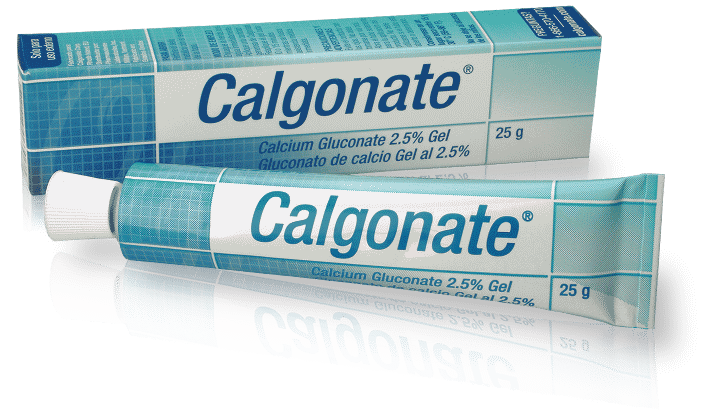 Calgonate® Gel is an effective topical 2.5% calcium gluconate gel used in first aid when hydrofluoric acid (HF) burns or contacts the body. 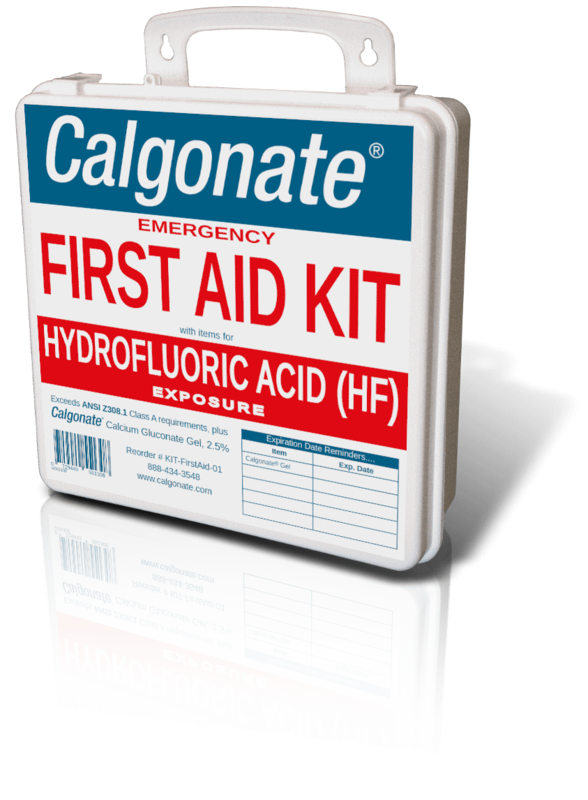 Calcium gluconate combines with hydrofluoric acid to neutralize HF's powerful fluoride ion. This helps stop it from penetrating into tissue and bone and doing further damage. The gel does NOT treat or heal HF burns that have already developed. This is why Calgonate® Gel should be used as soon as HF exposure is suspected, don't wait to see if burn symptoms develop! Who should stock Calgonate® Calcium Gluconate Gel? • People who work with hydrofluoric acid should carry the convenient 25g tube in their pocket. • People who transport or store HF in their facilities should include tubes of the gel in first-aid kits. • People who may respond to HF accident/burn victims should stock the gel. • Immediately wash/flush the area well with water. • Generously apply Calgonate® gel to the affected area. • Seek immediate medical attention as soon as these initial first-aid procedures have begun. Your procedure should also strive to avoid secondary HF exposure to the victim or any person giving assistance (by touching contaminated skin, clothing, equipment, or even the gel tube after first used). Do not apply Calgonate® 2.5% Calcium Gluconate Gel to the eyes. A 1% solution of calcium gluconate is recommended if HF comes into contact with your eyes. Calgonate® Gel has not been evaluated by the Food and Drug Administration. A factor that renders the administration of a drug or the carrying out of a medical procedure inadvisable. Of or relating to the cornea, the transparent part of the coat of the eyeball that covers the iris and pupil and admits light to the interior. An agent or substance that causes vomiting. An abnormal condition (as mottled enamel of human teeth) caused by fluorine or its compounds. An abnormally low concentration of calcium in the blood. The taking of material (as food) into the digestive system. The act or an instance of inhaling; specifically : the action of drawing air into the lungs by means of a complex of essentially reflex actions that involve changes in the diaphragm and in muscles of the abdomen and thorax which cause enlargement of the chest cavity and lungs resulting in production of relatively negative pressure within the lungs so that air flows in until the pressure is restored to equality with that of the atmosphere. A local response to cellular injury that is marked by capillary dilatation, leukocytic infiltration, redness, heat, pain, swelling, and often loss of function and that serves as a mechanism initiating the elimination of noxious agents and of damaged tissue. Soreness, roughness, or inflammation of a bodily part. Used as an antacid and antiflatulent; preparation of aluminum hydroxide, magnesium hydroxide, and simethicone. To convert (a liquid) to a fine spray; atomize. Relating to, functioning like, associated with, or carried on by the lungs. Of, relating to, used in, or affecting respiration. An agent, especially a chemical agent such as caffeine or alcohol that temporarily arouses or accelerates physiological or organic activity. Of, relating to, or common to a system: as a: affecting the body generally —compare LOCAL b: supplying those parts of the body that receive blood through the aorta rather than through the pulmonary artery c: being a pesticide that as used is harmless to a higher animal or a plant but when absorbed into the bloodstream or the sap makes the whole organism toxic to pests (as cattle grubs, mites, or aphids). Pertaining to, or applied externally to, a particular part of the body.